Your conservatory may have been overlooked during the winter months but in the spring and summer these spaces really come into their own. A conservatory can be a wonderful, well-used, space in the spring and summer time. However the amount of glass in a conservatory can mean that the heat from the sun can be intensified and the space can become too hot and bright. A simple way to ensure you can be comfortable all year round is to install specialist conservatory blinds to help regulate the light and the temperature of your conservatory. Whether you choose Vertical, Venetian, Roller or Pleated blinds we have the expertise, quality and choice to make your conservatory look stunning. The Perfect-Fit frame option is available for Venetian, Roller and Pleated blinds, this is where a frame is clipped into each glass pane of the conservatory to make the blind appear to be built in and therefore blends and fits in perfectly. It also makes them child safe as there are no accessible cords or loops that can pose as a strangulation risk. 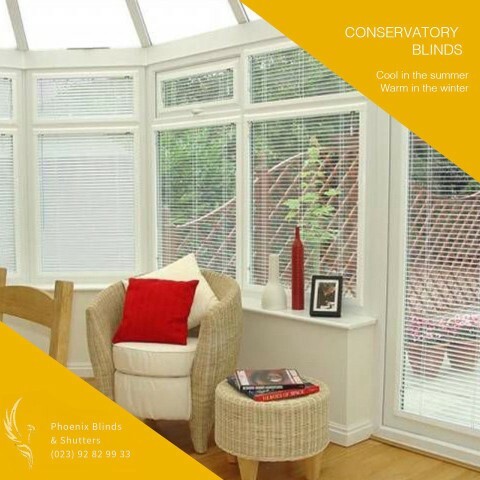 There are three main areas to consider when choosing conservatory blinds; the roof blinds, the side blinds and the door blinds. Roof blinds can be used in the summer especially around noon when the sun is at its highest point. They can be used to add shade from the sun whilst still letting softly filtered sunlight in. Having specialist conservatory roof blinds that are easy to control is key here and we offer a wide range of options to suit your circumstances. All of our blinds come in a wide range of materials from fabric to wood and metal. We have a huge range of styles, colours and patterns to suit your tastes so each element can be matched to your home perfectly. We know that it's important to get things right first time, so not only will we help you choose the right conservatory blinds, we will also measure for you. Your conservatory blinds will then be manufactured to the exact size. We can also fit them for you, leaving you free to get on with your life while we take care of everything. We can also offer custom fit bi-folding blinds for those with bi-folding doors. Don’t forget we have a showroom if you want to browse our range in person and talk to our friendly knowledgable team about your needs.